With August being Alain Mabanckou month, I didn't waste time moving on to his second translated novel, Broken Glass (published in French in 2005 and translated into English in 2009). Broken Glass (64, former school teacher) is madly in love with the bottle (particularly red wine) and a regular at the local bar Credit Gone West (I seriously love the names Alain Mabanckou comes up with). Stubborn Snail, the bar owner, “didn’t want Credit Gone West just to vanish one day” and so gave Broken Glass (a former aspiring author) a notebook in which “to record, witness and pass on the history of the place”. With the notebook in his hand, Broken Glass starts writing about Credit Gone West, its regular customers and the Trois-Cents neighbourhood in which he lives in. Filling the notebook was never going to be a problem - the regulars at Credit Gone West really just wanted to share their stories. There’s “the Pampers guy”, “the Printer”, Mouyeké, Robinette, and more. I won't give away their stories, but they're quite shocking, sometimes humorous, and pretty sad. As the novel goes on, we also hear Broken Glass's story and how he got to be where he is. Broken Glass is written with “no full stops, only commas and more commas”. Also don't expect sentences to start with Capital letters. If you can look past these Broken Glass is an enjoyable read. It's funny at times, shocking at times, and I have to say pretty creative. 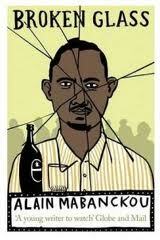 After reading this and African Psycho, I can see why Alain Mabanckou gets the praises that he does. Angoualima, the serial killer from African Psycho, even makes a cameo - well he gets mentioned. There are also many literary references (the blurb said "it contains the titles of 170 classics of international literature"). I will be honest, I only identified a few (The poor Christ of Bomba, The Death of the Wolf, Alice in Wonderland, and The Count of Monte Cristo were some of them) so I might have to read again just to see if I can do it. Has anyone been able to identify these literary references? I absolutely enjoyed it. While I'm not the biggest fan of getting into an alcoholics mind, still think I'd choose it over that of a serial killer. Already started reading Memoirs of a Porcupine. I have to say I love how he introduces the reader to the minds of diverse characters. He has a fan! And yes, I am determined to identify those 170 titles. We should definitely swap notes. I am sad that I missed almost all of the month! I had been so hoping to find a title of his to read. Sounds like a really interesting book! Thank you for the review. Please don't be. If you do get a chance to read any of his novels, I would love to read your thoughts on it as I always enjoy reading your review. And yes, it was a really interesting book :). I know I'm three years late but I just read Broken Glass and I loved it! On the 170 titles hunt as well!! Did you by any chance find the 170 titles? It's never too late :) and I actually never did. How many have you found?